Bazaar del Mundo’s annual Santa Fe Marketplace brings the colorful arts, crafts and cultures of Native Americans and the American Southwest to its festive shops in Old Town, Friday through Sunday, September 16-18. Amidst a vibrant outdoor marketplace, exquisite collections of authentic Native American jewelry, art, crafts and décor will be on display from Navajo, Cherokee, Hopi, Pima, Isleta Pueblo and Santo Domingo Pueblo tribe members, along with other noted Southwestern artists demonstrating and selling their goods. 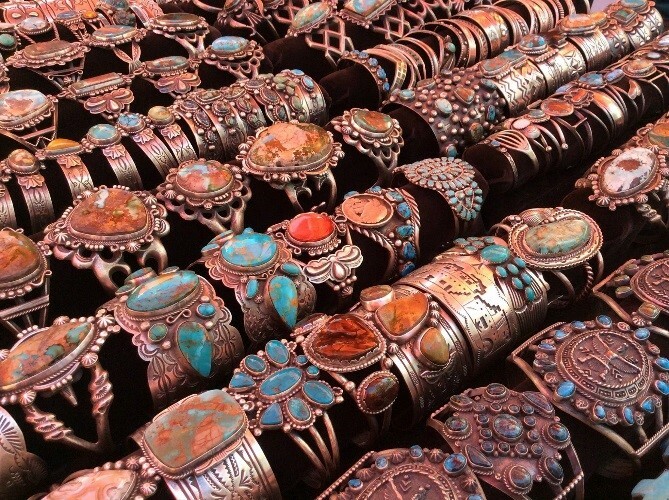 Art lovers will enjoy rare and stunning collections of Native American art and can also find an abundance of hand-made multi-stone inlaid jewelry, hand-woven Zapotec pillows and rugs, leather accessories, fetishes, storytellers, Pendleton blankets and one-of-a-kind, authentic Native American pawn jewelry. Returning to this year’s festival, pawn trader Art Quintana will appraise visitors’ fine Indian jewelry and family heirlooms (up to two pieces each). With 30 years in the Native American jewelry business, Quintana’s collection of traditional and contemporary necklaces, bracelets, rings, bolo ties, concho belts, earrings, beadwork and more, present a treasure trove of items he has discovered in pawn shops throughout the Southwest. Federico returns with his stunning collection of dramatic turquoise, red coral and pearl jewelry. Harry & Isabelle Benally are award-winning Navajo wood carvers who carve beautiful human and animal figures out of red juniper, aspen, cottonwood, redwood and alabaster. George Willis incorporates natural elements such as horn, stone and bone into whimsical jewelry and accessories inspired by his Choctaw heritage. Lester Abeyta from Santo Domingo Pueblo is a traditional lapidary artist best known for his beaded necklaces and lightweight earrings. Santa Fe Marketplace visitors can take in this dazzling showcase while enjoying live musical entertainment, and mouth-watering cuisine from neighboring Casa Guadalajara. The event runs 10 a.m. to 8 p.m. Friday and Saturday, September 16-17, and 10 a.m. to 5 p.m. on Sunday, September 18. For more information, visit www.bazaardelmundo.com. This entry was posted by The Bazaar del Mundo on August 29, 2016 at 5:26 pm, and is filed under Events. Follow any responses to this post through RSS 2.0. You can leave a response or trackback from your own site.